Fred Astaire and Ginger Rogers, Batman and Robin, Bert and Ernie. Some things were born to go better together. There are certain culinary marriages that endure the slings and arrows of foodie fashion and this dish is a testament to one such union. 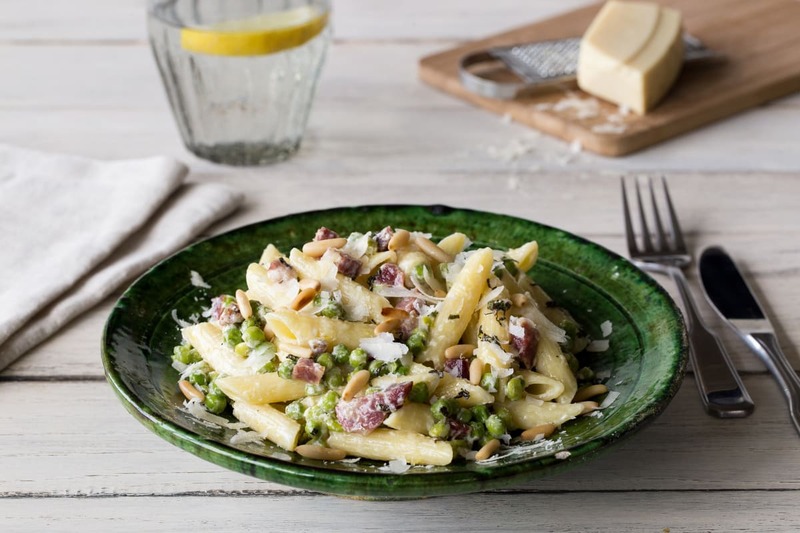 Marrying a time-honoured mixture of fresh peas, mint and pancetta this recipe spins a classic combination into a light, summery ensemble. It’s quick to make and perfect with a glass of something cold and bubbly. Bring a large pot of water to the boil. Roughly chop the mint leaves. Place the flat-side of a large knife on the garlic cloves and press down firmly. Peel off the skin and finely chop the garlic. Cook the penne in the boiling water for 10 mins with ½ tsp of salt. Tip: Keep 2 tbsp of pasta water before you drain it. Brown off the pine nuts in a non-stick frying pan on medium-high heat. Tip: They should take a few mins to start browning but watch them like a hawk as they can burn really easily. Once toasted take them out of the pan and keep them for later. Heat 2 tsp of olive oil in the same pan on medium-high heat. Cook the pancetta until it goes crispy around the edges. Add in the peas and continue to cook for 5 mins. Add in the garlic for a further minute. Add 2 tbsp of water from the pasta to the pan with the peas. Cook for a minute before stirring in the crème fraîche together with the vegetable stock pot and a few good grinds of black pepper. By now your penne should be ready. Drain it and mix into your sauce together with your chopped mint. Plate up your pasta, grate the parmesan over the top and sprinkle over your pine nuts. Tuck in and enjoy!